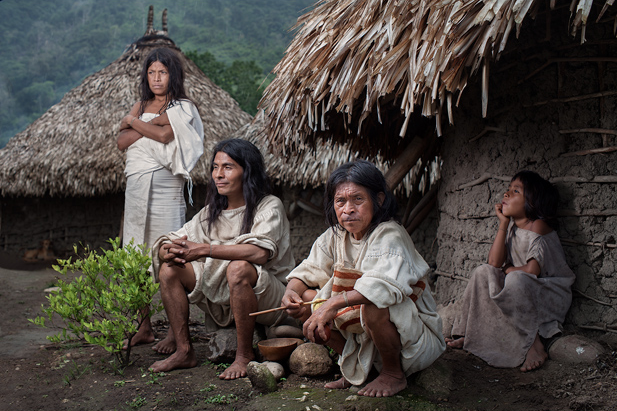 From the Heart of the World - The Elder Brothers Warning is a documentary about the Kogi people who inhabit the Sierra Nevada de Santa Marta mountain in northern Colombia. Direct descendants of the Tayrona people they survived Spanish Conquistadors - a feat no other tribe can claim. Long thought extinct, they reappeared from their mountain home to warn the world about the harmful damage it was causing. This documentary explores the traditions of the Kogi people and the wisdom they have learnt in their peaceful existence with the land they inhabit. The Kogi are the last surviving civilization from the world of the Inca and Aztec, and their cities are untouched by our world. The mountain they inhabit is an isolated triangular pyramid rising over 18,000 feet from the sea, the highest coastal mountain on earth. It is on a separate tectonic plate from the Andes, and its unique structure means that it is virtually a miniature version of the planet, with all the world’s climates represented. The mountain is quite literally a micro-cosmos, a mirror of the planet on which every ecological zone is represented and in which most of the plants and animals of the planet can find homes.The Kogi are authentic guardians of ancient knowledge that was shared by many communities that have been destroyed in the advance of “civilization”. They regard themselves as the “Elder Brothers”, protectors of life on Earth, They survived by being unseen, because they have a duty to use their knowledge to care for nature. Through their mind power and meditation they keep the world in balance. But now our destructive energy overwhelms the earth.So the Kogi Mamas, educated in darkness, trained to connect and work with the thought-energy in nature (“aluna”), have decided they need to reach out with practical advice. If we want to ask, they will respond. It is not too late, they say, to reverse the damage and help the world flourish again. The Kogi do not want to be met. But they do want to be listened to.And that is not for their sake. It is for ours. What is the Black Line Initiative?